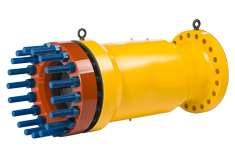 The Oil States Griplock™ Connector (GLC) is a mechanical pipe end connector used for pipeline repairs, reroutes and abandonment projects. The GLC utilizes collet grips that mechanically attach to a pipe and create a permanent, structural flanged end on the pipe. The GripLock™ uses standard, dual-barrier Viton seals to deliver long-term integrity and comes equipped with a test port to verify the annulus seal. Fast, reliable “single-set” design actuates grips and seals simultaneously. See the spoolpiece repair animation here. Single-set grips and seals save time during repair operation. Reversible collet grips structurally lock to the pipe. Inboard seals and outboard grips for NACE compliance. End gap adjustment and increased ovality tolerance. ASME Sec VIII Div 1, 2 and API 6H compliant as applicable. Type Examination Certification from Det Norske Veritas (DnV).